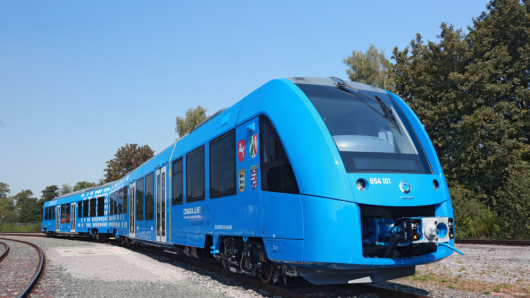 These trains in Germany are powered by hydrogen fuel cells. Special thanks to BBC News for this video. 138 Comments on "Hydrogen Trains"
Wow So cool I wish I could ride on that train. People can also drink the water the train gives out right? Hopefully you can drink it, that would be amazing! It may be more expensive, but it creates pure water! A win-win! It gives you so much information on the hydrogen train it tells you how it works soooooooo cool. This looks like it will take over the world! WHAT THEY HAVE HYDROGEN TRAINS!!!!!!!!!!!!!!!!! NO WAYYYY! I wonder how well we could utilize this technology in buses and planes. this is such a good idea. BTW that song in the back ground is LIT!!! That would make the world more eco-friendly. Wow. This is just incredible. Hopefully the future will make way for this amazing, beneficial invention! But didn’t it say it was expensive? I don’t even want to know how much! Amazing invention of the future! !